These rice paper parcels are very nutritious, quick and super fun to make. Once you’ve mastered the basic recipe, you can get creative with all your favourite ingredients, combining great flavours, colour and textures. The ultimate fast food. Finely julienne all the veggies and place into a large bowl. Heat a little coconut oil into a wok until hot, but not smoking. Add the veggies to the wok and gently cook for 3-5 mins until they become translucent. Use a wrist action to toss the veggies towards you, to ensure everything cooks evenly. Boil about a litre of water in a kettle, and then allow to cool slightly. When the veggies are nearly cooked, pour in about 1-2 tbsps tamari sauce around the inner edges of the wok (just above the veggies), allow to steam slightly then toss everything together until the tamari sauce is well combined. Pour the heated water into a roundeau or frying pan, and then gently submerge one round of rice paper into the water until it becomes translucent. Gently use tongs to lift out the paper, allow any water to drip off and then place the round on a clean chopping board. 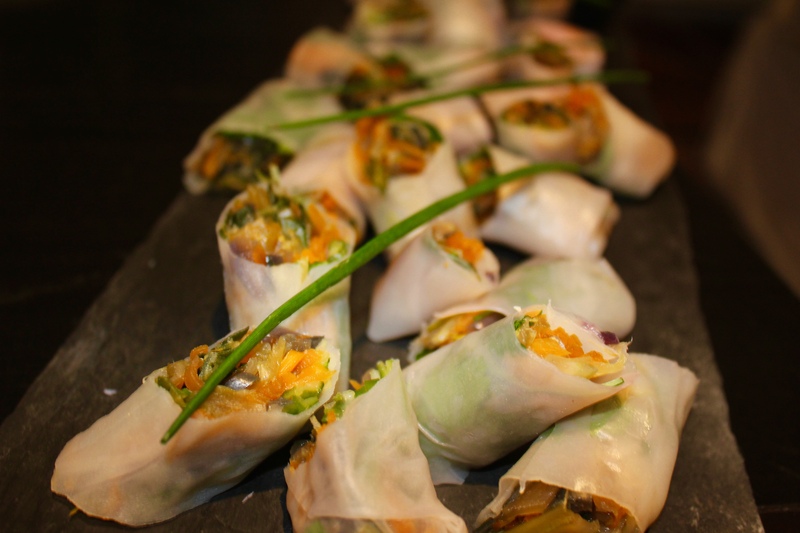 Using tongs, take small handful of veggies and place them into the centre of the rice paper circle. Gentle fold over one edge of the rice paper over the veggies, then fold in either end, then using your thumbs, ensure the parcel is tight and continue to roll over the remaining end of the rice paper to form a neat parcel. Continue until you have 4 similar sized neat parcels. Notes: These parcels make a great starter, main course or snack – just modify the number you serve per person. Get creative and make up your own delicious additions to these little parcels. Prawn, coriander and ginger, shredded cooked chicken and soy sauce, tofu and oyster sauce – the possibilities are endless. These rolls are packed full of phytonutrients and have incredible health benefits. Onions have high levels of vitamin C, & can really support your immune system. Onions contain chromium which assists in the regulation of blood sugar. For centuries, onions have been used to reduce inflammation & heal infections. Carrots are packed full of beta-carotene & fibre. They are also are packed full of antioxidants & are rich in vitamin A, C, K & B8, folate, potassium, iron, copper & manganese. Leeks are an excellent source of vitamin K. They contain fibre, manganese, vitamin B6, copper, iron, folate & vitamin C. Leeks also benefit you because they are a good source of vitamins A & E, magnesium, calcium & omega -3 fatty acids. Celery is rich in vitamin K & folate, vitamin A, potassium & vitamin C. They contain a large percentage of water & fibre too. Red peppers contain the highest amount of vitamin C of all the pepper varieties & several phytochemicals & carotenoids, particularly beta-carotene which has antioxidants & ant-inflammatory benefits. Tamari is a great source of fermented soy & I prefer to use a gluten free variety. It has vitamins B3, manganese & the mood enhancing tryptophan, which contains more protein than regular soy source. However please note a low sodium tamari sauce was used for this recipe. Please feel free to mix this recipe up with your favourite vegetables & it makes a great pre-dinner snack or food to be served at your Christmas party. These winter rolls are so good for you & delicious. They make for the perfect party food.